Big Red Car back from a Thanksgiving trip to Savannah (to see My Perfect Daughter, Wonder Husband, Lola the Bad Dog, Bella the Saint Dog, and My Perfect Granddaughter) and to Charlotte to see #1 Son for Thanksgiving dinner. For some reason, this Thanksgiving feels different than others. Not sure why. Really? 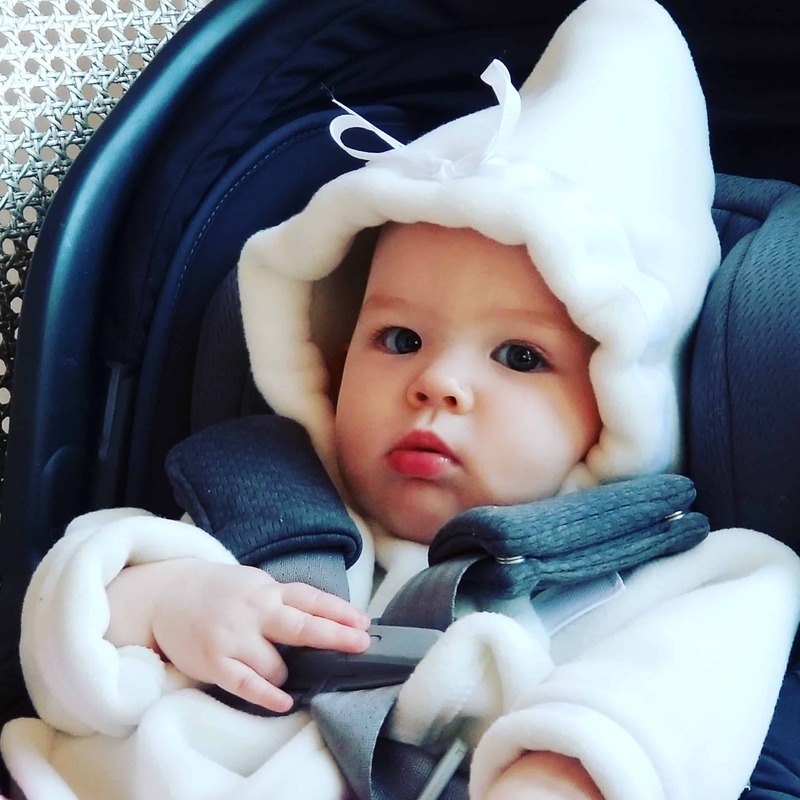 Baby Tempe (My Perfect Granddaughter, one of half a dozen Tempe’s including her grandmother and great grandmother). Southern thing – Faith, Hope, Charity, Temperance (thus Tempe). Note the gang sign. This was Baby Tempe’s first Thanksgiving and it was a good one. She wants to make sure you know she is not an elf. It’s just a funny hood. Very sensitive about this. She’s eleven months old in two weeks. So, this got me thinking — why can’t every day be Thanksgiving? OK, I realize that’s not likely, but why can’t we look at things with a continuing sense of gratitude and generosity? So, I came up with a list of things we can do to prolong that Loving Feeling. 1. Every day take a minute to continue the litany of gratitude. Put a little Thanksgiving in every day. 2. Make one meaningful act of goodness every day — make your day revolve around that act. Doesn’t have to be something enormous, just enough that it takes a couple of minutes to do. OK, like what, Big Red Car? OK, let’s get specific, shall we. 1. Call someone you haven’t spoken to in a long time and talk to them for fifteen minutes — try a shorter time if you’re out of practice, and, yes, relatives count including your siblings and parents. 2. Stop, buy a card, write it out, mail it. Send a picture of yourself or something of interest. 3. Bring something sinfully delicious to the office and put it anonymously in the cafeteria or somewhere it will get eaten. Never explain it. 5. Leave an obscene tip for some waitperson who looks like they could use it. Thank them in writing. 6. Write a letter to some teacher or coach or minister or rabbi and tell them that you still remember something they taught you. 7. Buy two tickets to the Nutcracker and give it to someone who would enjoy seeing it. OK, you get the idea, so take it from here. Plot it out a couple of days ahead of yourself. That’s it. Just that. Make the holidays go longer, farther, and stronger. You got this. But, hey, what the Hell do I really know anyway? I’m just a Big Red Car and Big Red Cars are always celebrating the holidays.